This winter did quite the number on our back deck. 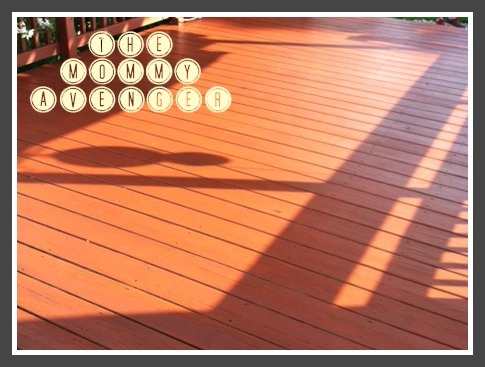 When the snow finally cleared, we were left with wood that had the last deck stain chipped and flaking. It was time to clean the deck and start fresh with a new coating of stain. Thankfully, our friends at Thompson’s WaterSeal always has a great selection of products that gets the job done. 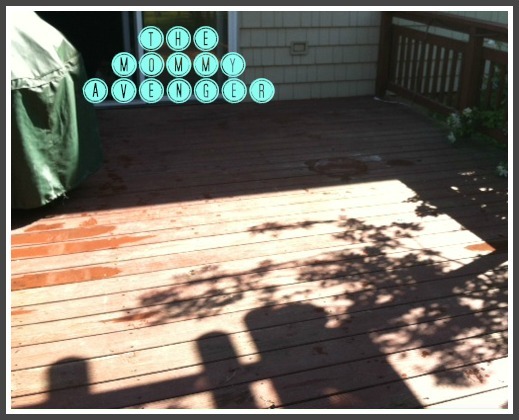 They sent me some Heavy Duty Deck Cleaner and their semi-transparent waterproofing stain in Sequoia Red to bring new life to our favorite summer space. 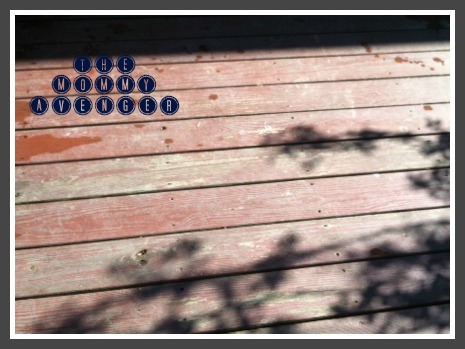 You would think staining the deck would be really difficult, but it wasn’t at all. We dedicated a sunny morning and got all six of our family members ready to go to work. Waiting for the sunny morning turned out to be the most difficult part of this process! Clearing the deck of all the furniture, we were ready to start the first part–cleaning and stripping the old stain. This great product really did all the work for us. We simply poured the solution straight onto the deck, scrubbing it in evenly throughout the surface of the wood. Letting it sit for about 15 minutes, we then power washed it off. This left us with a very clean surface that, once dry, would be perfect conditions for staining again. It was so easy to use! The sun was shining strong that day, so our deck dried in no time. We then were able to start painting the deck with the stain. The stain was a little deceptive. It looked very thin and watery, so we weren’t sure if it was going to give the coverage that we hoped for. We quickly came to find out, though, that the stain was perfect for what we were trying to achieve. It dried in a very rich tone and did so extremely fast. 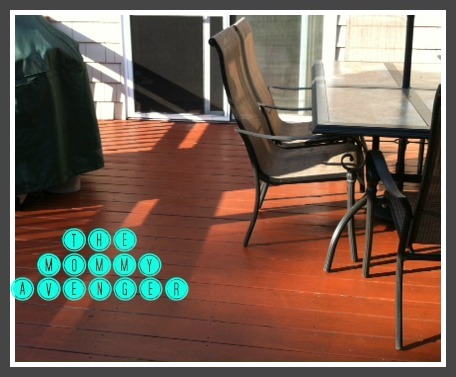 We were able to add another coat and before we knew it, we had a practically brand new deck before our eyes! All of this done with just a few hours of work! We knew we were racing the clock that day, as we had serious rainstorms in the forecast. It dried completely long before any rain appeared, but what we saw after the rain absolutely assured us that this product was going to work and work well! 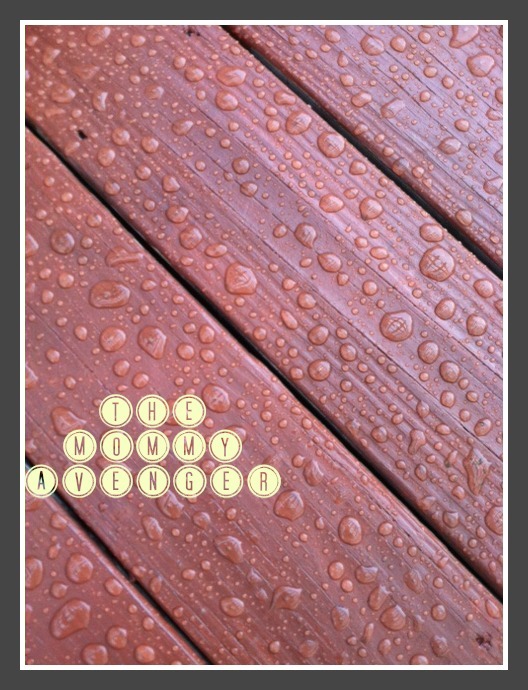 Just look at the water repelling on the deck after the rain came! Look at the great features of Thompson’s WaterSeal Waterproofing Stain! This is the most complete exterior stain line that they have ever offered. Increased durability for a better looking deck, longer. Elastomeric polymers help the dry stain expand and contract with the wood during temperature fluctuations, reducing cracking and peeling. Advanced acrylic polymers greatly improve resistance to scuffing and marring. Waterproofing protection exceeds industry standards, while the coating resists mildew and UV damage. On horizontal surfaces like decks, the Transparent Stain is guaranteed for three years, the Semi-Transparent Stain is guaranteed for four years and the Solid Stain is guaranteed for five years. Latex-based formulas provide soap and water clean-up. 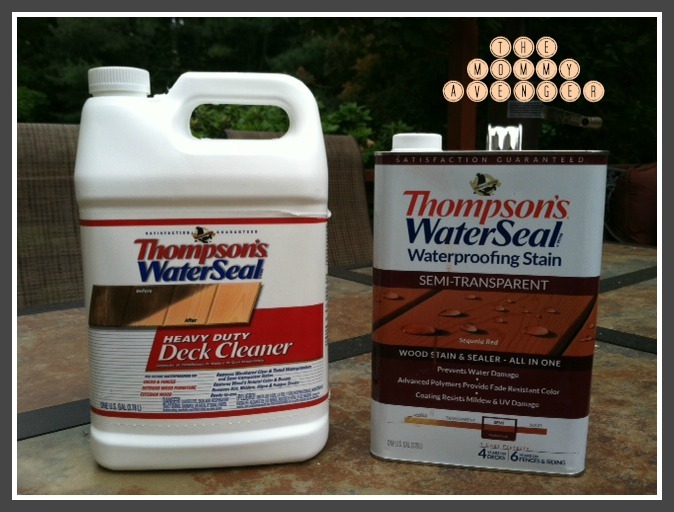 I am thrilled with the results of using Thompson’s WaterSeal products on my deck and highly recommend them to you! I am impressed with the way it works so well and I have to say, it feels really smooth and nice on bare feet when walking out to the pool. I am so happy we refinished the deck and know that we will enjoy the results for some time to come. You can pick up the stain I used exclusively at Home Depot. Very impressive results, indeed! So economical. You got a new deck with the purchase! It’s nice you were able to finish it even before the rains came. Your deck looks amazing! That is one of the projects we have erm, on deck for this summer. You all did a great job your deck looks amazing! We have a concrete patio but I would love to add on to it sometime in the near future. I will have to remember this product. wow that was night and day difference!!! Wow what a difference. The deck look amazing now. Your deck looks awesome! We’re actually looking to seal ours so I’m glad I came across this post! Your deck looks brand new! We need to do something with ours.. its falling apart..
OMG, that’s amazing! I don’t have a deck, it’s mostly cement patio. Is there anything good for that? It’s in desperate need of a reno look. OMG that’s amazing. Is there anything for cement? My deck is weathered and has never been protected. I wonder if I could use this on it or if it is to late? My deck was weathered before we moved in and this is after we treated it once before. I think it would be helpful for sure! Your deck came out amazing. I guess we will be doing this to ours this summer. Thanks for sharing, it’s good to actually see some results from someone. You deck looks absolutely gorgeous!!! This product works like magic! How much is that container in stores? It is about $27 per can. I used two and a half for my deck and that was including the trelis above, which used the most by far. Awesome results! It looks great and it certainly seems to do what it is designed to do. I would love to have my husband build us a desk, your is just gorgeous! It looks lovely! We need to build a deck soon. It’s time to do our decks again. We have always used Thompson’s and we will this time too! That looks really good. I have been wanting to get a deck for the longest time but just don’t know where to start. Guess I better call my dad. Though we don’t have a deck here to prevent it from getting wet when it rains I think this waterseal will also works on wooden furniture to protect them from getting damage overtime by liquid substances poured accidentally. Thats awesome, we need that stuff, when we bought our house, we have a crappy crappy backporch that needs fixing. I did this on a deck we had many years ago and it did a fantastic job! It made the wood last WAY longer and prevented splinters. Wow…you did an awesome job! DIY is always better as long as it comes out great. What a difference! I really like the result, that it’s easy to uese and that they also have a long guarantee! Sounds, and looks, like a great product! Excellent results! Is this product still holding up pretty good after 2 years? It actually is! I think we need to do a touch up on the high traffic foot areas, but other than that, it is completely covering everything else!